Request a Mowing Service Today! Quick Mow offers Lawn Maintenance, Tree Trimming and Landscaping Services for San Antonio, Windcrest, Castle Hills, Olmos Park, Terrell Hills, Shavano Park, Alamo Heights, Leon Valley, Hollywood Park, Live Oak, Converse, Universal City and other communities within Bexar County. We have over 15 years of experience and we would like to offer our services and expertise to you. Here at Quick Mow, we understand that today’s busy lifestyles can create a burden for many home and business owners trying to beautify their property. When you need someone, put your trust in a company that can help you achieve your goals! Although we are a full-service provider. 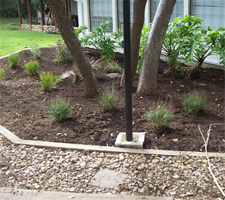 We are primarily in the business of routine lawn and landscape maintenance for commercial and residential properties. We are family owned and operated. We provide professional quality services every time we visit you. We respond quickly to your concerns and we stand behind any service we provide. We have over fifteen years experience in the horticulture field with extensive knowledge in different areas such as grasses, trees, plants, bushes, tropical’s and ground covers. Our knowledge of plants and their habitats will allow us to give you the best, long lasting results in South Texas. We take pride in our work and we guarantee that our services will meet your highest standards! We are committed to providing the best our company has to offer the San Antonio area and the surrounding communities. Call (210) 389-4909 or Click to contact a Landscaping Professional. We serve all of San Antonio including the surrounding areas of Windcrest, Castle Hills, Olmos Park, Terrell Hills and Shavano Park, Alamo Heights, Leon Valley, Hollywood Park, Live Oak, Converse, Universal City and other communities within Bexar County.